While I liked 2011’s “The Hangover Part II”, I can’t admit it was the most original story. I liked it almost in spite of itself. It was inevitable, wasn’t it? In the age of the unnecessary sequels, it was only a matter of time before there was another follow-up. Naturally, I was a little concerned/suspicious/wary of a second sequel, but I’ve invested this much time so one more movie wouldn’t kill me. 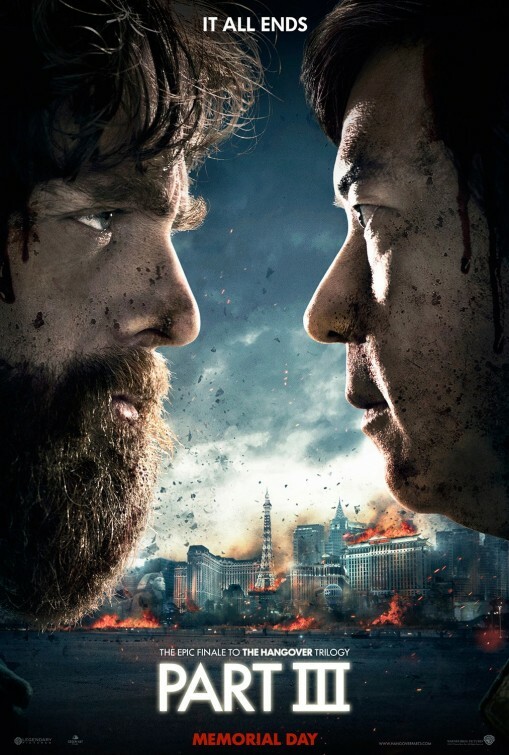 And away we go with 2013’s “The Hangover Part III”. It’s been two years since the hijinks in Bangkok, and the Wolfpack has moved on….for the most part. Alan (Zach Galifianakis) has hit a bit of a rough patch and gone off his meds. His family and friends are worried about him though and manage to convince him to go to a quasi-rehab center in Arizona. Well, that’s the plan at least. With Phil (Bradley Cooper), Stu (Ed Helms) and Doug (Justin Bartha) along for the ride, the quartet heads out to bring Alan to the facility only to be stopped in the middle of the desert by a revenge-seeking gangster, Marshall (John Goodman). Years ago, Marshall had a costly run-in with a certain Leslie Chow (Ken Jeong). Marshall threatens to kill Doug unless the group can bring Chow to him. Recently escaped from a high security prison in Thailand, Chow won’t make it easy though. From Tijuana to Las Vegas, the Wolfpack has one last adventure. Have you made it to the third paragraph of this review? Congratulations! I imagine most people know/knew prior to starting this review whether or not they were going to seek this sequel out. Did you like “The Hangover” (a classic) and “The Hangover Part II” (meh but entertaining)? Then you’ll like this movie. It is simple as that. Don’t expect anything hugely groundbreaking, just good, solid laughs with characters we’ve come to like a lot by this third movie. My biggest worry heading into this sequel from director Todd Philips (the first two “Hangovers”, “Old School”, “Due Date”) was that….well, that it would be the same movie I’d seen twice before. I came away from Hangover 2 liking it, but feeling ashamed I liked it because it was literally the same movie as the first with Bangkok replacing Las Vegas. Thankfully, Phillips and script co-writer Craig Mazin didn’t go for ‘same old, same old’ here, and the movie benefits greatly from it. There’s no literal hangover here. The crew doesn’t wake up after a night of debauchery and partying and have to find out how they got to that point. Instead, we get some background with Jeong’s Chow, Goodman’s Marshall, the Wolfpack and some $42 million in gold bars (just go with it). It’s a little forced, but it’s different. Drinking, drugs, debauchery and everything else aside, I came back to the movie because of the cast. Cooper, Helms and Galifianakis are perfect together. Phil the smarmy, confident, good-looking guy, Helms the tortured demon-possessed quasi-normal guy, and Alan the all-around, off-the-wall screwball. Put those weird differences in personality together, and you’ve got a perfectly cast comedy trio. What they get into gets crazier and crazier, but ‘Part III’ is just better if you go along with it. Alan has an epic man-crush on Phil who just wants to get Doug back while Stu resents everything about what they’ve gotten themselves into. Oh, and Bartha returns in a part that has to be painful for him. He’s there, then gone, then back, then gone again as the story requires. The best supporting part goes to Jeong though as Leslie Chow, international thief and all-around nut bag. The character is the definition of unpredictable. At different points, he sings karaoke to Johnny Cash’s “Hurt”, pretends to be a dog and eats dog food, parachutes off Caesar’s Palace, escapes from a high security prison, and steals a hidden cache of gold. Goodman too is a welcome presence as Marshall, the mobster who wants nothing but revenge on Chow. 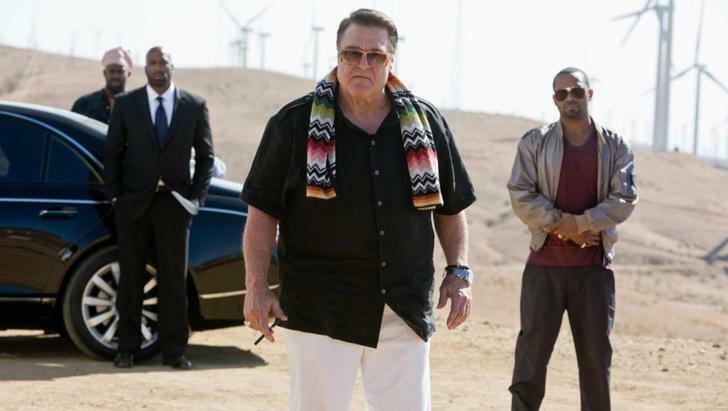 Also new, Melissa McCarthy is a scene-stealer as Cassie, a pawn shop owner who takes a shine to Alan. Heather Graham as Jade the stripper and Mike Epps as Black Doug also return from the first flick. And last but not least, yes, we see 4-year old Carlos, a really good scene between him and Alan. There’s that something missing that would have made this sequel really special, but I can’t put my finger on it. It’s missing a certain energy, and at 100 minutes feels a tad rushed. With all the craziness, it never slows down and wraps up rather quickly/abruptly. None of this is a movie-killer, but it does prevent it from reaching that full potential. It’s really good stuff that could have been great. 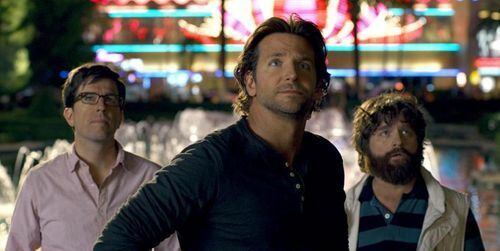 And according to cast and crew, this will be the final Hangover movie. That’s the right decision. Now that said, stick around for the credits. It’s the perfect final scene, bringing everything full circle with one good surprise after another. A worthy finale to a series that had its ups and downs but one that’s definitely finishing out strong.